Club Penguin Cheats by Mimo777 Club Penguin Cheats by Mimo777: Club Penguin April Fool's Party Update! i hate members' stuff! but the party should be fun. the april fool's party is always my favorite. Can't wait to see what's behind those doors! That's EXACTLY what I thought! It does look like Alice in Wonderland. You are right! It really does! Well, I am really psyched too! We just have to wait! Woha look at the news and mail things on that screen! I'ts cool! Thats so great about the sneak peek! Yea! Love the April Fool's day party. Does anybody remember? Is it just on April 1st, or does it last the whole week? I can't remember from last year. Anybody think there will be a FREE ITEM? Eh? it reminds me so much of alice in wonderland!Lol i just called my mom when i saw the post to ask her to buy me a cp membership cause she was at the store! me to, isn't everything behind doors awesome? I think this years theme is doors...LOL. Wow! That is sooooo funny! ROFL. XD I am so excited to see the fun pranks that CP pulls on us! I think so! There is every year! Yay finally a party like me! Weird!!! Yeah im pretty sure it starts April first and ends April fifth and i think theres gonna be a free item. cool i really cant wailt. 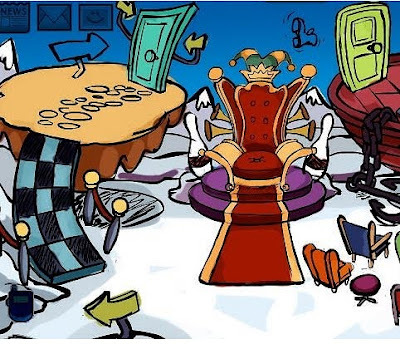 April Fools Party is the best party on club penguin ever!!! I just don't like the parties because there will be a lot of members stuff only and my membership expired. But that hasn't stopped me has it! Wow i cant wait!I am a member! it kinda looks like alice in wonderland! I can't log onto CP! When I try, it says that all the servers are full, but the servers only had 1 green thing each. They can't need 12 whole hours to change CP for the April Fools Party! It was open earlier this morning, how long will it be shut? Yeah, it seems like there will be a members only room. Cool. Do you know if they are having the Easter Egg Hunt that they always have? I hope they do because they didn't do the St. Patrick's day party this year and I was quite dissapointed. What do you people think? ⓂⒾⓂⓄⓈ ⒸⓁⓊⒷ ⓅⒺⓃⒼⓊⒾⓃ ⒸⒽⒺⒶⓉⓈ ⒶⓇⒺ ⒶⓌⒺⓈⓄⓂⒺ!!!!!! Hey mimo!!! your website is AMAZING! sometimes i wonder how you do it! i thought id tell you about the april fools day party... i found out about a really cool glitch. In the ski lodge, if you walk on the bottom left corner, you end up at the light house!lol. my name is Brick 6 or 1 Peaches in club penguin.